Big "M" Janitorial & Floor Maintenance is a licensed, bonded and insured company that provides contract cleaning and custodial services to business and industry, including carpet cleaning and window cleaning. Big "M" Janitorial & Floor Maintenance was organized to help business project a professional image and to better maintain their assets. Through responsible janitorial service, our goal is to provide a clean and sanitary environment where your employees or tenants feel comfortable and can work productively. Big "M" Janitorial & Floor Maintenance is the only cleaning contractor you will need to call! In addition to our thorough day and evening janitorial services, Big "M" also provides other services for your special cleaning needs. For example, we have a floor care team that specializes in stripping and refinishing floors. Big "M" runs a complete carpet maintenance service. Staffing: Our employees are individually screened, trained, and prepared for each assignment. Big "M" Janitorial excels in making sure our staff is all well prepared. Those who meet our standards attend an orientation program explaining our company and the cleaning techniques that we use. Upon completion of this program, the employee is scheduled for on-site training. We are committed to a policy of equal opportunity employment. Supervision: In order to provide an orderly chain of command, and to maintain a superior standard of quality, an area supervisor is assigned to each job site. 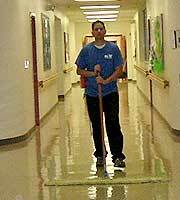 The area supervisor is responsible for the success of the janitorial team. We also schedule timely visits with our clients to review our performance. Attitude and Appearance: Big "M" selects only the most courteous, honest, and well disciplined applicants. Our employees are taught to perform duties in an alert and vigilant manner with respect to their surroundings. Big "M" personnel are trained to exhibit three important behavioral traits: courtesy toward others, integrity on the job, and proficiency on their work. They are taught that a calm, dignified bearing earns respect. Big "M" believes that good personal appearance fosters respect; each of our employees will be clean in person as well as in dress.